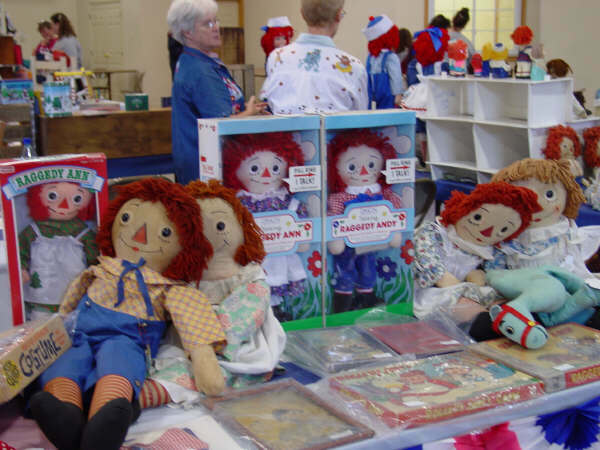 The Original Raggedy Ann & Andy Festival draws Collectors and Raggedy Enthusiasts from all over the world. 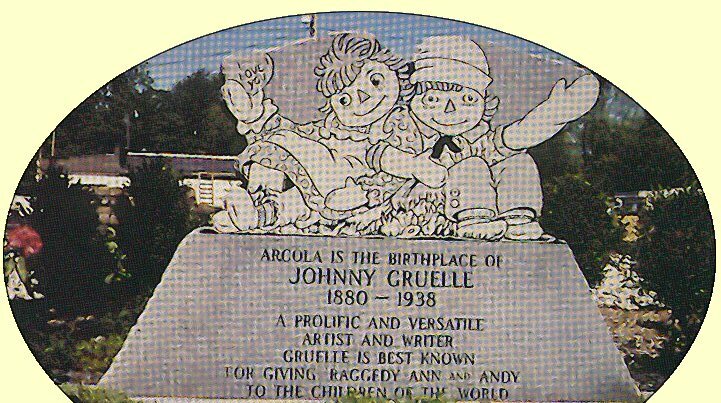 Johnny Gruelle, the creator of the beloved doll, was born in Arcola. The Festival is great fun for the whole family. 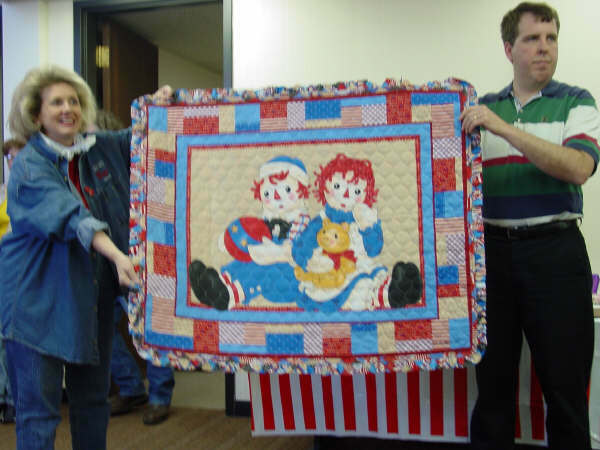 Raggedy Enthusiasts are the friendliest and most generous and welcoming people you will ever meet, and whether they're checking for the best way to complete their collection or just chatting away about Raggedy Ann, they're a great bunch! My husband Frank and I traveled with our granddaughter Courtney, to the 15th Annual Raggedy Festival in May 2004. 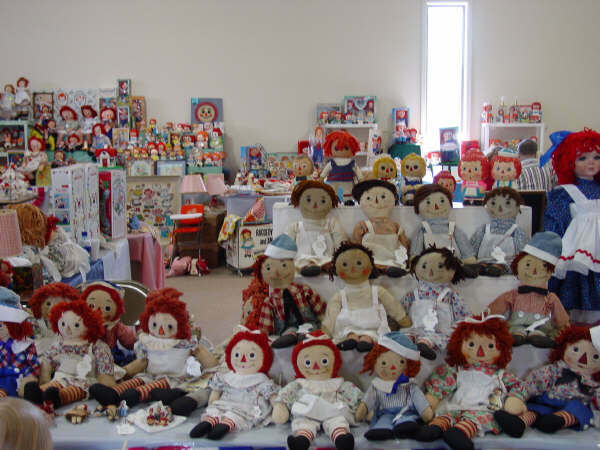 I made several extra character dolls, Belindys and denim Raggedy purses to sell and set up a display in our room. 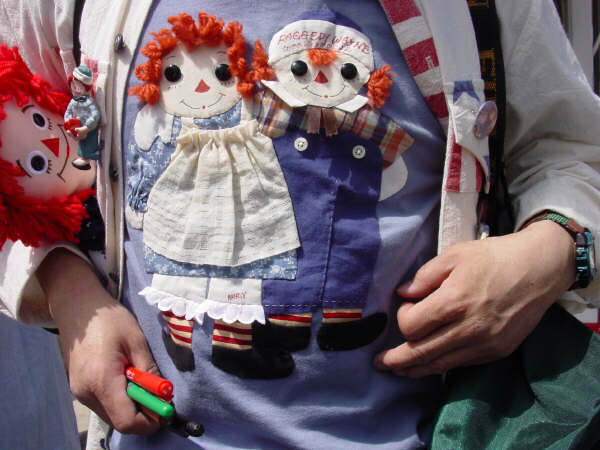 Many of my customers had been encouraging me to come and bring my dolls for several years. I was so thrilled to finally get to meet so many of you. shopping for "Raggedies" and visiting. My husband and I were busy greeting and meeting new Raggedy friends in our room. 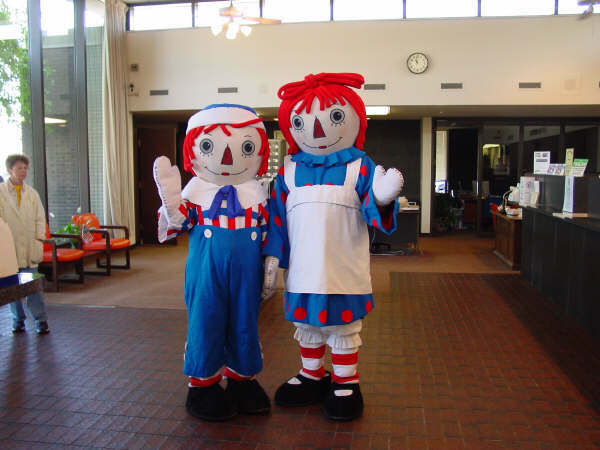 I made Raggedy Ann outfits for Courtney and I and we entered the "Raggedy Ann 'Look Alike' Contest"
I won the $20 First Place Prize, which only added to the fun and excitement ! including nearby Amish communities. The rural area is lined with Amish homes, businesses, and schools, plus horse drawn buggies. We enjoyed the beauty and tranquil setting of the Rockome Gardens Theme Park. Arcola is a quaint little town with a Historic Downtown area that has maintained it's original Old-brick tree-lined streets of days gone by. 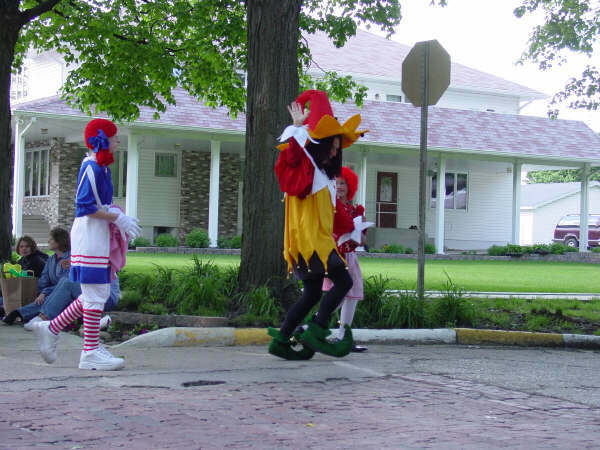 It offers Unique little shops, including Antiques and Hand-Crafted Amish furniture and Museums. 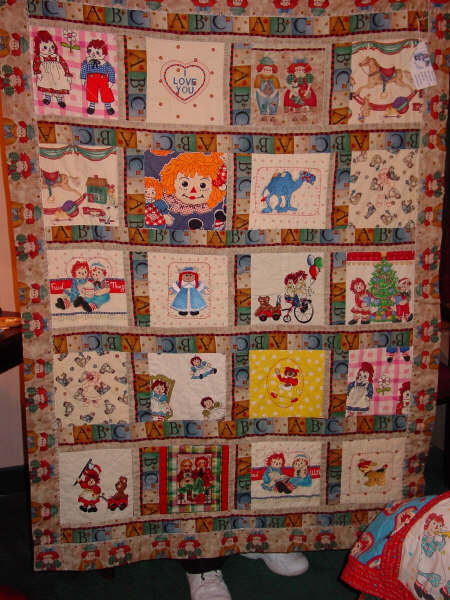 The Amish Interpretive Center presents the heritage of the Amish through exhibits and artifacts. The trip served as a wonderfully educational experience for all of us. Our granddaughter had been excused her from school in exchange for a written account of her trip. She was proud to share the experience with her classmates and friends. It was also her first experience at flying............and she LOVED it!! However, Frank has never really been a traveler so it was actually a very unexpected blessing when he announced he was taking us in 2004! 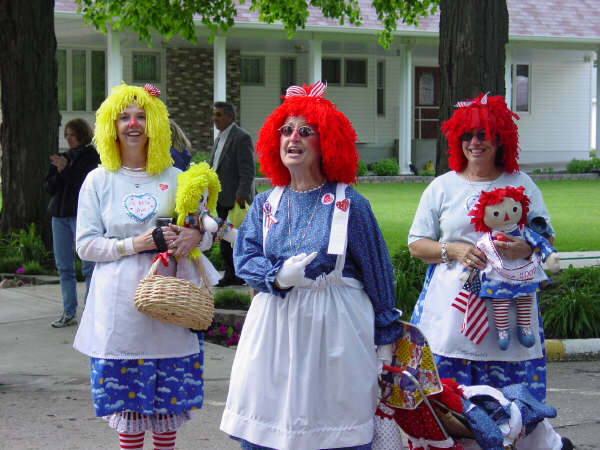 After winning 1st Place in "Raggedy Look Alike Contest"
Please scroll down to view additional pictures of the Festival. 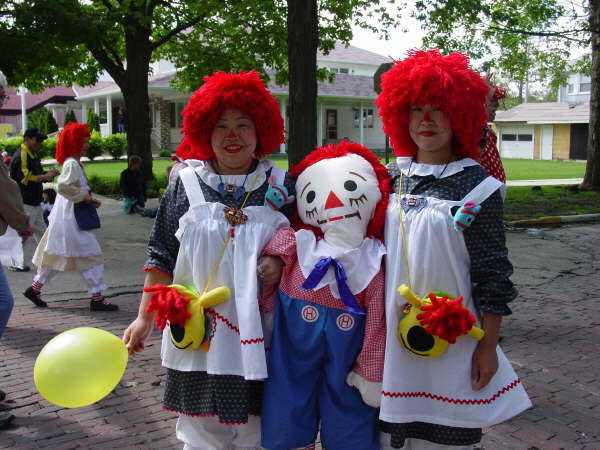 Cynthiana, Kentucky hosts a Raggedy Ann Festival to honor the heritage of the creator of this soft, lovable doll. 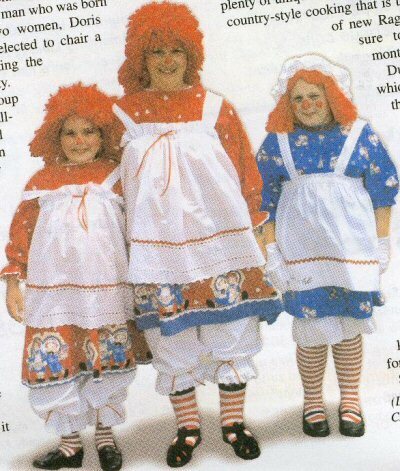 Richard Buckner Gruelle, the father of Raggedy Ann’s creator, Johnny Gruelle, was born in Cynthiana on February 22, 1851. 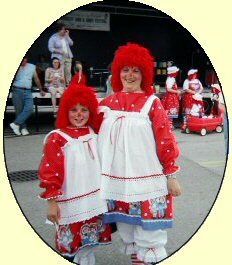 Here are a few pictures from the 15th Annual 2004 Raggedy Festival.....the first and only one I have been blessed to attend. To View More Pictures of the Festival CLICK HERE !! !